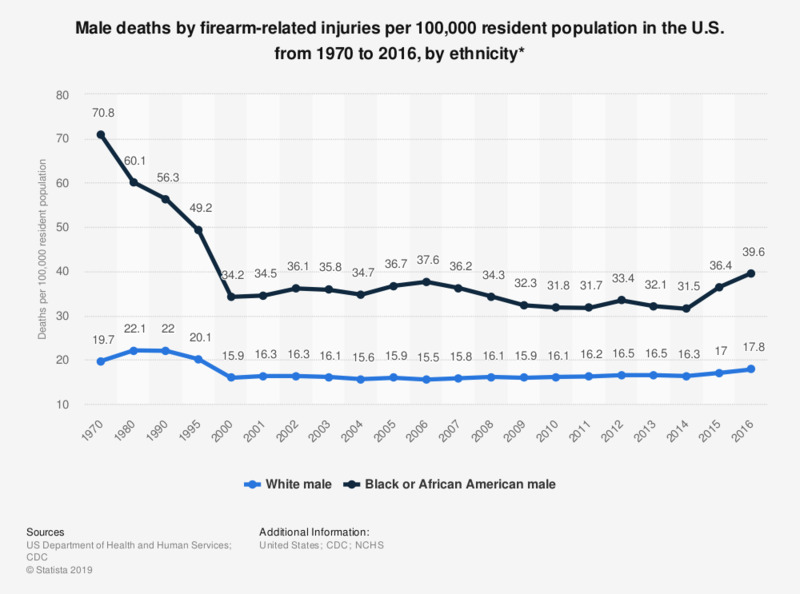 This statistic shows the number of male deaths by firearm-related injuries per 100,000 resident population in the U.S. from 1970 to 2016, by ethnicity. In 2016, there were 17.8 white male deaths per 100,000 resident population in the U.S., compared to 39.6 deaths per 100,000 population among black or African American males. Starting with 1999 data, cause of death is coded according to ICD–10. Age-adjusted rates are calculated using the year 2000 standard population. Prior to 2001, age-adjusted rates were calculated using standard million proportions based on rounded population numbers. Starting with 2001 data, unrounded population numbers are used to calculate age-adjusted rates. Everything On "Racial and ethnic health disparities in the U.S. " in One Document: Edited and Divided into Handy Chapters. Including Detailed References. Is the number of refugees the government has pledged to take over the next five years too many? Do you think having an increasing number of people of many different races, ethnic groups and nationalities in our country makes this country a better place to live, a worse place to live or doesn’t make much difference either way?